All those pristine white New England Georgian churches have to be kept looking good, and this means large quantities of white paint. Here, Trinity Congregational Church in Concord MA gets a new coat. 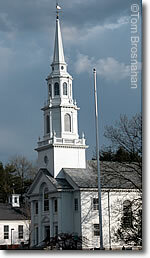 Although some New England churches are of other colors, white is traditional for most.